A regular summer resident and migrant. The Great Crested Flycatcher was common during the Minnesota Breeding Bird Atlas (MNBBA). Broadly distributed across the eastern half of the United States from small woodlots and riparian woodlands on the Great Plains east to the Atlantic Coast. The Great Crested Flycatcher is also found in portions of Canada’s Prairie Parklands and east along the southern portion of Ontario, Quebec, and the Maritime Provinces. Populations reach their highest densities in the southeastern states from North Carolina south to northern Florida and west to southern Alabama (Figure 1). Assigned a Continental Concern Score of 8/20 by Partner in Flight. Medium- to long-distance migrant; the majority of these flycatchers winter in Central America and northern South America. Unique among Minnesota flycatchers, the species is a secondary cavity nester that utilizes natural cavities, cavities excavated by woodpeckers, and an assortment of human structures, including nest boxes, drain pipes, buckets, and anything that approximates a cavity. In more southern latitudes, shed snakeskins are frequently used as nesting material. Breeding distribution and relative abundance of the Great Crested Flycatcher in North America based on the federal Breeding Bird Survey from 2011 to 2015 (Sauer et al. 2017). Roberts (1932) considered the Great Crested Flycatcher a common summer resident throughout the state’s forests and woodlands. He wrote, “Wherever there are woodlands throughout the length and breadth of the state, there the loud, rather harsh call of the Crested Flycatcher may be heard.” Even in western and southern Minnesota the species could be found within the scattered woodlots and shelterbelts. Although he noted that it was one of the “common birds of the heavy forests,” confirmed nesting records (i.e., nests with eggs or young) were only available from 6 counties mostly in east-central Minnesota: Becker, Chisago, Hennepin, Otter Tail, Ramsey, and Sherburne. Inferred nesting records (i.e., reports of nest building and young out of the nest) were available from Mille Lacs and Scott Counties. Nearly forty years later, Green and Janssen (1975) simply reported the species was a resident throughout the state. The exceptions were Lake and Cook Counties, where it was reportedly scarce and where breeding had not yet been confirmed. Janssen (1987) further noted its scarcity in the northeast and added it was rare in the far north-central regions of the state as well. He included a distribution map that excluded Cook County, most of Lake, St. Louis, and Koochiching Counties, and the northeastern corner of Itasca County. The map identified 22 counties where nesting had been confirmed since 1970. Hertzel and Janssen (1998) later added an additional 6 counties to this list. A total of 1,866 breeding season locations documented by the Minnesota Biological Survey (MBS) since the late 1980s largely confirmed these earlier accounts. MBS records were absent from the intensively cultivated regions of the Red River valley and upper Minnesota River valley. It was sparsely distributed in the far northeast and southwest corners of the state (Minnesota Department of Natural Resources 2016). During the MNBBA, observers tallied a total of 3,103 Great Crested Flycatcher records in 39.9% (1,896/4,751) of surveyed atlas blocks and in 55.2% (1,289/2,337) of the priority blocks. Breeding evidence was confirmed in 115 blocks (Figures 2 and 3; Table 1). The species was found in all but one (Pipestone) of Minnesota’s 87 counties, and breeding evidence was gathered in 47 counties (one block straddled both Le Sueur and Nicollet Counties). Of these, 24 were additions to the list published by Hertzel and Janssen in 1998. Great Crested Flycatchers were widely distributed throughout the Eastern Broadleaf Forest and the Tallgrass Aspen Parklands Provinces and in the western half of the Laurentian Mixed Forest Province. They were least abundant in the Prairie Parkland Ecological Province, although common along the upper Minnesota River valley. The predicted breeding distribution map for the species, which combines MNBBA data with data on climate, habitat availability, landscape context, and detectability, emphasized the flycatcher’s broad distribution (Figure 4). Present at relatively low densities throughout the state, the probability of encountering flycatchers is particularly low in Cook County and portions of Lake County. Breeding densities are predicted to be highest in the northern regions of the Eastern Broadleaf Forest Province and in northwestern Minnesota, east through the northern regions of Koochiching County. This is not dissimilar to the relative abundance map generated with data collected by the federal Breeding Bird Survey (BBS). Figure 1 shows a broad band of higher breeding densities throughout the central region of the state, extending northwest into the Aspen Parklands. The more open, parkland nature of forests in this ecological transition zone between the forests and grasslands likely provides ideal habitat conditions for the flycatcher. The distribution and relative abundance of the Great Crested Flycatcher as described by Roberts in 1932 appears to have changed little in the intervening years. One can surmise that the species is more abundant along the western and southern edges of the state’s northern forest region than it was a century ago. Industrial, recreational, residential, and small-scale agricultural development in these areas created a fragmented landscape of open woodlands favored by the species. Similar changes were observed in Wisconsin and Michigan. In both states the species has either extended its range northward into the heavily forested regions, or it has simply become more abundant in areas where landscape changes created more suitable habitat (Cutright et al. 2006; Chartier et al. 2013). Elsewhere within its breeding range, the Great Crested Flycatcher also expanded its range northwest into central Canada, when prairie fires no longer kept the parklands clear of woody vegetation (Smith 1996). Populations appear to have expanded in eastern Canada, but it is unknown if the expansion is real or simply the result of an increased number of observers (Miller and Lanyon 2014). Breeding distribution of the Great Crested Flycatcher in Minnesota based on the Breeding Bird Atlas (2009 – 2013). Summary statistics of observations by breeding status category for the Great Crested Flycatcher in Minnesota based on all blocks (each 5 km x 5 km) surveyed during the Breeding Bird Atlas (2009-2013). Summary statistics for the Great Crested Flycatcher observations by breeding status category for all blocks and priority blocks (each 5 km x 5 km) surveyed during the Minnesota Breeding Bird Atlas (2009-2013). Predicted breeding distribution (pairs per 40 hectares) of the Great Crested Flycatcher in Minnesota based on habitat, landscape context, and climate data gathered during the Minnesota Breeding Bird Atlas (2009-2013) using the General Linear Modeling method with an adjustment for detectability. The Great Crested Flycatcher is primarily an inhabitant of hardwood forests or mixed stands of hardwoods and conifers. Although it is found in coniferous stands, it usually uses the scattered deciduous trees, avoiding sites that are purely coniferous. Open or semi-open woodlands dominated by mature hardwoods are preferred, as are mesic to wet sites, including lowland hardwoods (Figure 5). Forest edges are frequently used; but when the flycatcher is found in the interior of a stand, the canopy is usually fairly open and broken. The interior of closed canopy forests are avoided. The species has adapted well to urban and suburban landscapes and is frequently found in neighborhoods and parks with mature shade trees (Danz et al. 2007; Miller and Lanyon 2014; Cutright et al. 2006). In a long-term study of forest birds conducted on the four national forests in northern Minnesota and Wisconsin, the National Forest Bird (NFB) monitoring program, Great Crested Flycatchers were found in a wide variety of habitats. Lowland hardwoods were the preferred habitat, but hemlock stands (in Wisconsin) and lowland shrubs with scattered trees were also used (Niemi et al. 2016). Habitat data collected at MNBBA point counts where Great Crested Flycatchers were detected demonstrated a strong preference for pine-oak barrens, northern hardwoods, and oak forests (Figure 6). Typical breeding habitat of the Great Crested Flycatcher in Minnesota (© Lee A. Pfannmuller). Habitat profile for the Great Crested Flycatcher based on habitats within 200 m of point counts where the species was present during the Minnesota Breeding Bird Atlas (2009-2013). Monitoring data collected by the BBS was used to generate a North American population estimate for the Great Crested Flycatcher of 8.9 million breeding adults (Rosenberg et al. 2016). In 2013, biologists estimated that Minnesota supported 4.0% of the North American population (Partners in Flight Science Committee 2013). When that percentage is applied to the 2016 population estimate, the statewide estimate for Minnesota is 356,000 adults. MNBBA point count data were used to test the BBS-derived estimate and generated a considerably larger population estimate of 795,000 adults; the confidence interval, however, was quite large. Although the Great Crested Flycatcher is a common bird in Minnesota, breeding densities are significantly higher in the southeastern United States (Figure 1). In Minnesota, the average number of flycatchers observed per BBS route each year is 4 birds; in the Southeastern Coastal Plain, a region that stretches from eastern North Carolina south to northern Florida and west to Mississippi, the average is 12 birds per route (Sauer et al. 2017). At the local level, the NFB monitoring program on the Chippewa and Superior National Forests documented an average of 0.37 pairs of Great Crested Flycatchers per 40 ha in the Chippewa and 0.08 in the Superior National Forest (Niemi et al. 2016). The difference reflects the flycatcher’s preference for the upland and lowland hardwood forests that are more prevalent in the Chippewa and its general avoidance of the coniferous-dominated stands that are more prevalent in the Superior. Since the BBS program began in the mid-1960s, the Great Crested Flycatcher has demonstrated one of the most stable populations of any songbird in North America. Since 1966 the average annual change in population numbers across the BBS survey area has been only −0.03% per year. More recently the trend line even suggests a slight increase (Sauer et al. 2017), and biologists estimate that the continental population has increased 2% since 1970 (Rosenberg et al. 2016). The long-term stability of the North American population masks numerous regional increases and decreases that are scattered throughout the species’ breeding range (Figure 7). These regional differences likely reflect local habitat changes. The Great Crested Flycatcher benefits from development and forest management practices that fragment woodlands and forests, creating more favored habitat edges. It is negatively impacted in areas with intense competition for nesting cavities or where “clean” forest management practices remove critically important snags (Miller and Lanyon 2014). In Minnesota, the species’ population has been stable since 1967 (Figure 8). Figure 7, however, suggests there are wide differences across the state, from increasing populations in the west and south-central regions of the state to long-term declining trends throughout much of central and northern Minnesota . In the Chippewa National Forest, the flycatcher population has been stable since forest-wide monitoring began in 1995; in the Superior, populations were too uncommon to assess long-term trends (Niemi et al. 2016). Population trend map for the Great Crested Flycatcher in North America from 1966-2015 based on the federal Breeding Bird Survey (Sauer et al. 2017). 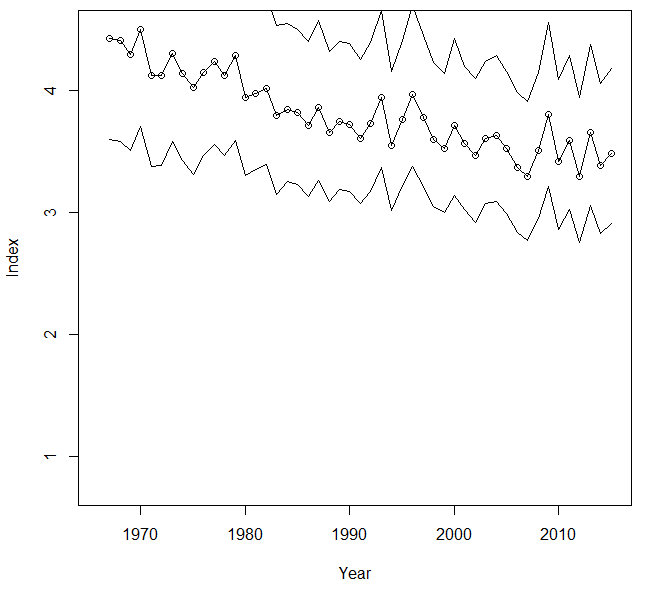 Breeding population trend for the Great Crested Flycatcher in Minnesota for 1967–2015 based on the federal Breeding Bird Survey (Sauer et al. 2017). The Great Crested Flycatcher is not a conservation priority at either the state or the federal level. Its stable population trend, relatively large population size, and utilization of a wide variety of fragmented habitats result in a Continental Concern Score of 8/20 (Rosenberg et al. 2016). For the time being, the future of the species appears secure. Even the 2010 State of the Birds report on climate change concluded that warming temperatures did not pose an immediate threat to the species, rating its vulnerability as low (North American Bird Conservation Initiative 2010). In northern Minnesota, the implementation of forest management practices that create and maintain snags may be one of the most important conservation tools to ensure that the showy, but seldom seen, Great Crested Flycatcher remains a common member of Minnesota’s avifauna. Smith, Alan R. 1996. Atlas of Saskatchewan Birds. Regina: Saskatchewan Natural History Society.